New pallets from Millwood are designed and manufactured to the product standards of the National Wooden Pallet & Container Association (NWPCA), which assures quality and customer satisfaction. Design: Millwood can manufacture new pallets to any customer specification. We also use the Pallet Design System from NWPCA and Cape Pack, the load design software system from Cape Systems (http://www.capesystems.com), to custom design pallets and unit loads that optimize the performance of our customers' unit loads during shipment while minimizing packaging costs. Export: Millwood pallets can be heat treated and certified to meet ISPM-15 export requirements for timely international shipments. 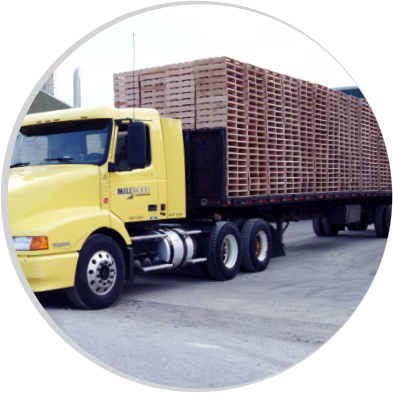 Service & Support: Millwood offers full truckload shipments of new pallets as well as multiple pallet sizes per truck. Among pallet companies, Millwood has more than 1.5 million square feet of production and distribution space so we can warehouse new pallets for vendor-managed inventory (VMI) programs and deliver Just-In-Time (JIT) to support lean manufacturing operations. Sustainability: Waste generated from our new pallet manufacturing processes is recycled into wood composite materials, biofuels, landscape products and animal bedding. 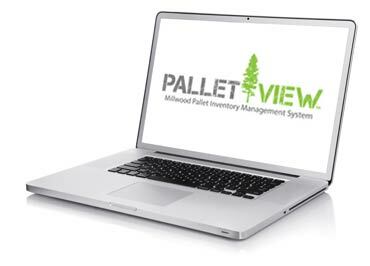 Pallet Management with PalletView™: Engineered to improve inventory control and eliminate waste, this asset tracking system provides the end to end visibility of individual assets as they make their way across the supply chain. From a single web-based portal, customers can track the number pallets they have under management, the total number they have at any location and where each has been delivered. Our software also lets you track the condition and availability of your entire pallet pool.